The playwright, Frank Ogodo, hails from Yala in Cross River State. He attended Awori-Ajeromi Grammar School, Lagos State and the Federal School of Arts and Science, Ogoja, Cross River State. He earned his first degree in Communication Arts from Cross River State University, Calabar, in 1989. He has worked in the Cross River State Governor's office before joining the Federal Civil Service in Abuja. He is both a member of the Association of Nigerian Authors (ANA) and the Nigerian Union of Journalists (NUJ). Other of his works are The Intruder and The Promises of the gods. Corruption and desperation are part of the human weaknesses that have caressed the human mind and taken hold of man's thinking faculty since time immemorial. Man is inevitably and naturally corrupt; he is sometimes desperate for certain things which seem insignificant but very important to him, and he can go an extra mile, legal or illegal, to achieve those things he yearns for regardless of the dangers ahead. Man mostly displays his corruption instinct when he is given the slightest opportunity or when he is in position to help others. He uses such position to enrich himself to the detriment of others. This is a valid claim as it is obviously evident in the behavioural patterns of our politicians and public office holders. 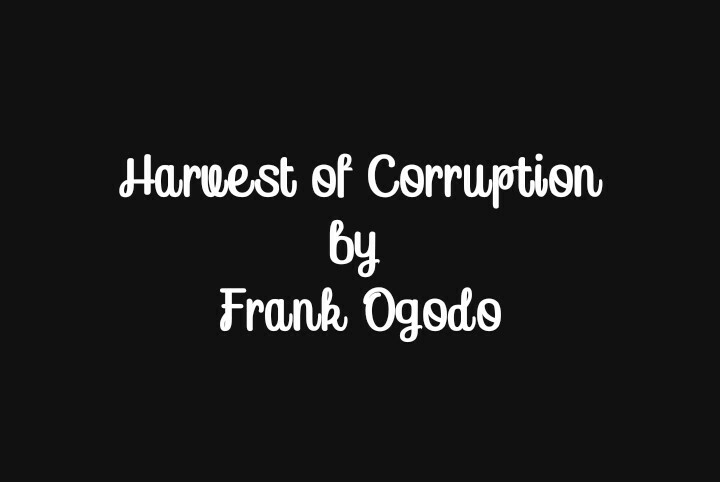 Inarguably, this is what is showcased in Frank Ogodo's play, Harvest of Corruption. With Chief Haladu Ade-Amaka being the godfather of corruption, Frank Ogodo's Harvest of Corruption brings to limelight the happenings in developing countries of the world, particularly Africa where corruption, official and social, is at its peak and how political and social institutions are weak to fight Africa's corrupt men and women in official positions. Also, the play showcases the story of a young university female graduate, Aloho, whose desperation for a job (due to her many years of unemployment) leads to her tragic end. Of course, karma is no respecter of anybody. What goes around comes around. As the name of the play implies, all corrupt public office holders in the play have an equal harvest of their nefarious activities in the end. The play which is in eight scenes centres on the nefarious activities of public servants and Madam Hoha in a fictional country called Jacassa. The principal public servant and Minister of External Relations, Chief Haladu Ade-Amaka, is known for his unusually large tummy like that of most African politicians. He is a replica of any of the corrupt practices one can think of. He has a retinue of girls with whom he philanders with and who also do cocaine trips for him. Like most politicians or public servants, he robs the state of her wealth in an act popularly referred to as 'pen-robbery'; thus, leaving the masses in abject poverty. Chief Haladu Ade-Amaka is not alone in this business; he is aided by other public servants such as the Police Commissioner who serves at the police headquarters in Darkin; Justice Odili, a robust man with pot belly; Ochuole who organises girls for Chief Ade-Amaka; Aloho, a girl who has just been offered a job in Chief's office as a protocol officer; Madam Hoha whose restaurant is a safe place for criminal activities under the guise of a drinking bar; the defense council who fights hard to defend the corrupt Chief, and those who bear cocaine for Chief. However, there are other characters who are neither corrupt nor applaud Chief Ade-Amaka and other corrupt public servants for their corrupt practices. These characters are Ogeyi, the good friend of Aloho; ACP Yakubu, the one who ensures that Chief pays for his corrupt deeds; Inspector Inaku, the inspector who obtains (at a fee) the relevant documents for prosecuting Chief from Ayo, the clerk in the office of Chief Ade-Amaka; the Doctor who refuses to abort Aloho's unwanted pregnancy; the Prosecution Counsel who prosecuted Chief, and the custom officer who refers Aloho's drug case to the Jacassa Drug Law Enforcement Agency (JDLEA). Aside showcasing the nefarious activities of public servants and how they are prosecuted in the end, the play projects the plight of a naive and an unemployed university graduate, Aloho. In her desperate search for a job, Aloho comes in contact with her secondary school mate, Ochuole, who promises to secure a job for her by speaking with the Honourable Minister of External Relations, Chief Haladu Ade-Amaka, on her behalf. Ochuole keeps to her promise, and Aloho is offered a job as one of Chief's protocol officers, not knowing that the job requires more than what she thinks. She is also unaware of the fact that Ochuole is being used by Chief to perpetrate criminal activities, especially drug trafficking. As regards this, Madam Hoha is not left out as her restaurant/hotel is the hideout for Chief's criminal activities. As one of her hidden job descriptions, Aloho is given a package containing hard drugs to deliver in the United States of America. Having no idea of what is contained in the package, Aloho accepts the package from Chief Ade-Amaka wholeheartedly and subsequently gets arrested at the airport by drug law enforcement officers. Aloho is later released by the Judge and the prosecutors after collecting a huge sum of money from Chief. Upon her release, she discovers that she is pregnant by Chief and decides to abort the pregnancy after feeling being humiliated for having been used by Ochuole and Chief Ade-Amaka. Unfortunately, after several futile attempts to abort the pregnancy, Aloho dies after giving birth to the child. Ogeyi Ogar, Aloho's true friend (whose pieces of advice she had turned down) is bent on having all those who used her friend punished. As a result, she reports Chief to the police. After an investigation initiated by ACP Yakubu and a careful examination of the legal issues in the illegal activities of Chief Ade-Amaka by the Judge of the Wasa High Court of Justice, Chief Ade-Amaka and his accomplices are found guilty. In the end, justice prevails as the all the corrupt public officers in the play have a harvest of the corrupt practices they've sown for years. The play is set in a fictional country known as Jacassa. Just like every other country of the world, Jacassa is a place where corruption abounds. The appropriate punishment for each culprit is equally harvested in good measure. 1. Theme of corruption. This is the predominant theme, and it is projected by Chief Ade-Amaka and his accomplices. 2. Theme of desperation and impatience. This theme is projected through the actions of Aloho. 3. The evil that men do lives with them. 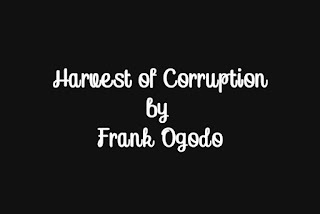 It is no news that all the corrupt public officers in the play have a corresponding harvest for their corrupt practices. 4. Evil does not last forever. Of course, anything that has a beginning has an end. The corruption in the play doesn't strive till end of the play. 5. Theme of greed. Greed is the rationale behind the actions of the corrupt public servants in the play. He is a clerk in the Ministry of External Relations. He is the doctor in charge of Wazobia Hospital. He is consulted by Aloho to terminate her unborn baby. At first, he tells Aloho the criminal implication of abortion but later collects ten thousand naira from Aloho to get rid of the unborn baby. However, his attempt to abort the pregnancy fails. She is Chief's secretary in the Ministry of External Relations but neither takes part in his criminal activities nor supports his actions. He is a detective police inspector serving under the office of the Assistant Commissioner of Police. He is an elderly gentleman who serves as a prosecution counsel during the trial of Chief Ade-Amaka. He is a legal practitioner who fights tooth and nail to exonerate Chief from all allegations but to no avail. He is one of the accomplices of Chief's criminal activities. Other minor characters are Registrar, Halimatu, Ojo, Okpotu, SSS etc. The play is structured in eight scenes without act. Each scene forms the basis for the continuation of another. The language of the play is simple and gives the play a realistic sense. Dramatic monologue is a long piece of conversation between a character and self. In the play, ACP Yakubu is seen talking to himself while sitting on his chair. In this state of monologue, he talks about the corruption that married the country so much that nobody has the power or moral courage to fight against it. Surprise is dramatic element in which what happens in the play is against the wishes of the audience.In the play, the actions of Aloho, to a large extent, create a sense of surprise owing to her religious beliefs.